Pig heads have been left on the entrance to a migrant camp in the Netherlands, in an effort by some to give the Muslim refugees a hellish nightmare welcome to one of Europe's most tolerant nations. Unidentified perpetrators left some 14 pig heads at the entrance of a refugee center in Eschmarkerveld, near the city of Enschede, on early Wednesday morning. 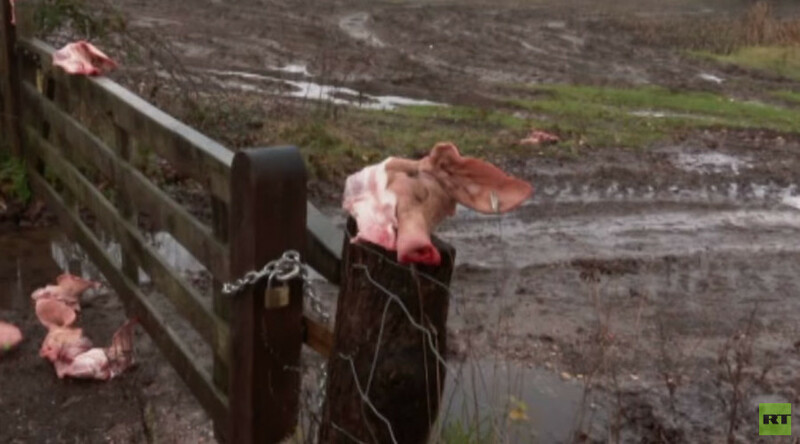 Nine pigs' heads were found on the fence, the rest laid out on the ground. Plastic bags full of blood in which the heads have been transported were also found at the site. According to RTV Oost the troublesome scenery was discovered by local police. However, a spokesman said that no threats have been made towards the migrants and that no one has yet claimed responsibility for the act. A picture of the field decorated with pig heads had surfaced on Twitter on Wednesday with the caption: "If democracy fails, people become angry and desperate. Welcome to the hell of Eschmarkerveld." Local media suggests that such a graphic message is not only meant for the migrants, but also the government, which decided to set up the refugee center in September. When the decision was made the residents of Eschmarkerveld objected to the opening of the refugee camp, arguing they would feel "unsafe." However despite the massive outcry the municipality went on with the planned center. A police spokesperson said that it is an environmental crime and therefore the perpetrators will be pursued with information retrieved from tags found on the pigs’ ears. Disturbing scenery of disfigured pigs might especially come out offensive for mainly Muslim worshipers, who abstain from consuming pork because swine is considered 'impure' animal in Islam. In September, the Netherlands agreed to take further 7,000 refugees under new European Commission plans to spread refugees throughout the EU. The extra arrivals will add to 2,000 migrants already agreed to by the Dutch government in May.